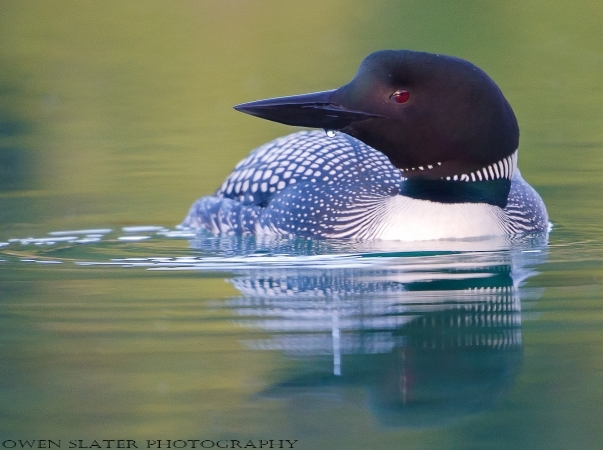 There are few sounds in nature that signify wilderness and pristine waters than that of the song of a loon. They are one of my favourite signs of spring in the mountains and it’s always a thrill to see them! I lucked out with this one as it actually approached me when I noticed it along the river’s edge. 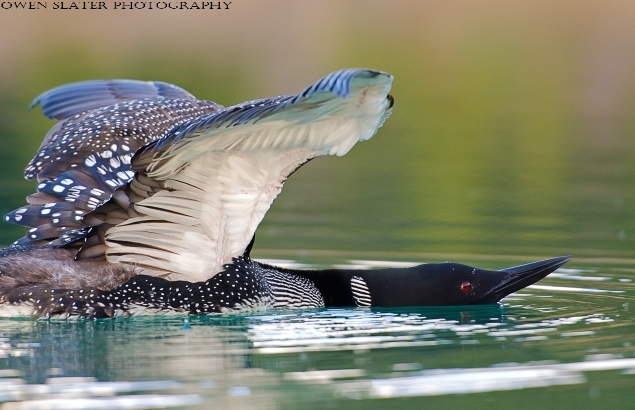 The loon swam closer and closer before it stopped a short distance away. I’m not sure if it saw its reflection in my lens or if he was displaying for some other reason, but whatever the cause he proceeded to give me a wonderful territorial display by stretching out his neck and legs and lifting his wings. After getting a few photos of this interesting behaviour I packed up my gear and left him be as he resumed his fishing nearby. One of the most remarkable wildlife sights I have ever seen happened by chance on the drive back from Yellowstone last month. 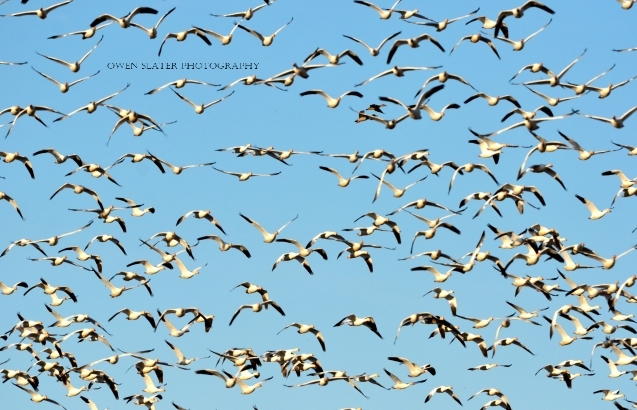 Initially it started off with a relatively small flock of about 50 snow geese passing overhead. Soon I noticed another flock and then another, but it wasn’t until I glanced west to take in the Rockies on a clear, beautiful day that I saw almost the entire western horizon dotted with these geese! 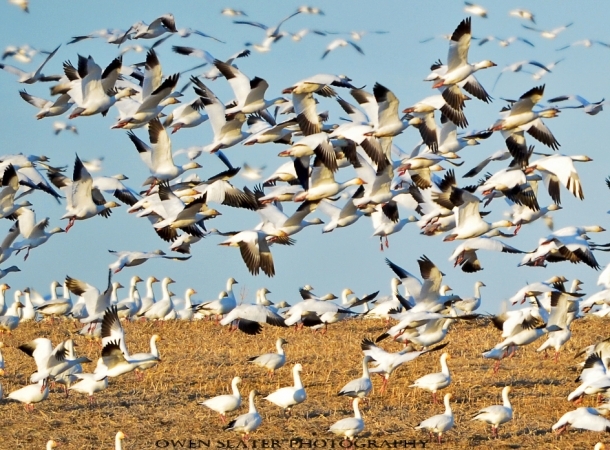 I had heard about the snow geese migration, but I had never witnessed it before. To see hundreds of thousands of birds in the sky at once was so amazing I had a hard time keeping my eyes on the road. As luck would have it, a large majority of them were headed in our direction. No more than a few kilometers up the road, thousands of these birds starting landing in a farmer’s field. This must have been a cue for the rest of the massive flock to land for the night, because within minutes there were thousands upon thousands of snow geese fluttering to the ground while making their distinctive calls along the way. I found a side road to turn off onto and started firing off photos. In the below photo a small fraction of the goose flock flew overhead. See if you can spot another species of bird in with the geese. A few minutes later, about a 1 kilometer stretch of the field was covered with these geese. They continued to honk as they gobbled up grain, which prompted the geese still in the sky to circle around and start landing as well. Within 10 minutes there were hundreds of thousands of birds on the ground! 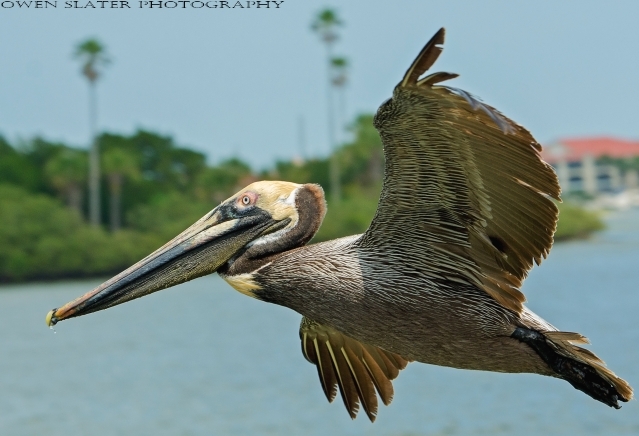 There are a few examples of animals that have adapted to living with the billions of us! Snow geese are one of these. Their population has grown to over 5 million breeding birds, a 300 fold increase since the 1970’s! Much of this has been attributed to the rapid agricultural expansion that has occurred in the west, creating a smorgasbord of food for these birds as they make their way to and from the Arctic every Spring and Fall. Other possible factors include rising Arctic temperatures. However, that only partly explains their population expansion. A lot of it also has to do with their behavioural adaptation to a changing environment. Historically they fed in marshes but a few of the smart ones or maybe by chance some stumbled across the fact that people leave tonnes of uneaten food in the fields every year. With the flat rolling prairies it’s also easier to see predators approaching from a distance or from the sky. This new-found migration strategy must have been passed along to the point that almost all the geese stop over in these fields to fuel up before continuing their journey. Below is a photo of the organized goose chaos. Multiply this photo hundreds of times and you will get an idea of what it was like to be next to this massive flock. 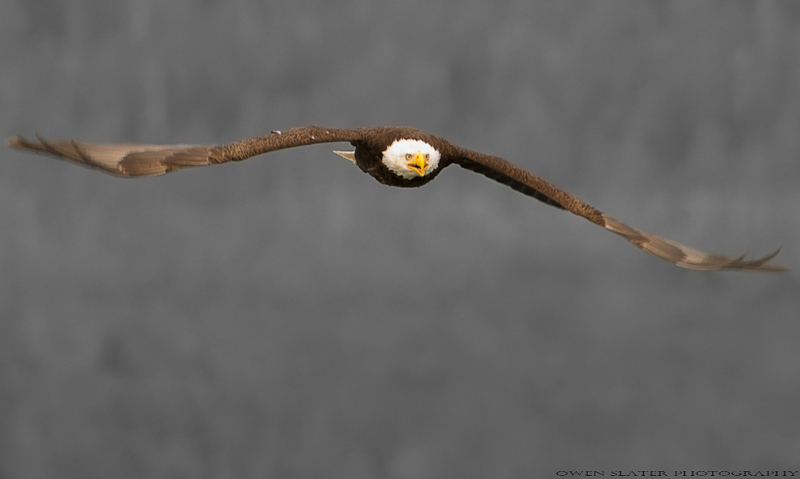 It’s remarkable that they manage to coordinate their movements enough that they are able to land, take off and feed without colliding into each other and plummet to the ground. It certainly is an experience I will never forget. Last weekend I came across a peculiar scene with this bald eagle literally swimming across an icy cold river using its wings as oars. Up in the sky the distinctive call of ravens could be heard as they circled. The eagle managed to make its way to shore, climbed up a bank and rested in the snow. After several minutes it attempted to fly off but was unable to get any lift. It did this a few more times but still couldn’t get off the ground. Thinking that it had fractured one of its wings, I put my gear down and hiked into the forest to try to keep out of its sight while I approached it. I got to within about 30 feet before I ran out of any tree cover. By then the eagle had spotted me and I made a dash for it (don’t worry, I’m a trained professional and I have handled many birds of prey!). It quickly beat its wings and ran through the snow as fast as it could. Just as I was getting close enough to grab it, it managed to get out onto an ice-flow that would not support my weight. It seemed to know this because it turned and watched me as I came to a halt. Thinking that it might come back onto more stable land, I headed back into the forest to wait. About thirty minutes later, I moved into a better vantage point but it must have caught sight of me. With its powerful legs it sprang up into the air and managed to get just enough lift to take off. Thankfully, it cleared the river, flew several hundred feet and managed to perch in a nearby tree! While I didn’t see the initial incident it is highly likely that the ravens managed to ground the eagle in the river. Once there, it became waterlogged. By resting in the powdered snow, some of the water was absorbed while the rest turned to ice. By repeatedly trying to take off, the ice crystals on the tips of the feathers would have been knocked off, which must have been just enough for it to regain flight. Thankfully no broken bones, but likely a bruised ego and a new respect for ravens! I on the other hand learned that eagles can swim and I have a new respect for their ability to tolerate frigid conditions and still survive!